The 2016 Women Composers Festival of Hartford presents “Lift Her Voice,” an evening of music, dance, poetry, and community dedicated to the safety and empowerment of women and children in our city and beyond. “Lift Her Voice” will feature composers Tatev Amiryan, Margaret Bonds, Sadie Harrison, and Tawnie Olson, vocalists Schauntice Marshall and Anna Hayrapetyan, dancer/choreographer Stephanie Simpson, and chamber music group Cuatro Puntos, along with members of the music team from St. Patrick-St. Anthony Church, WCFH board members, and Hartford residents. 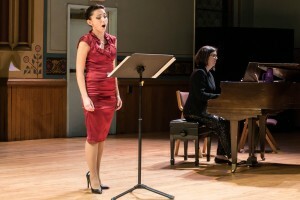 Subjects of the performances include the poetry of Langston Hughes, the Armenian genocide, and the censorship of music in Afghanistan. Although some of the material is tragic, the overall message is one of hope for the future through activism and advocacy for the safety and empowerment of women and children. This concert is our gift to the Hartford community, and is free and open to the public. Donations will be accepted and shared with adocacy groups that share our mission, including Catherine’s Place (a women’s shelter connected to St. Patrick-St. Anthony Church) and Cuatro Puntos’ Chamber Music for Peace initiative.